UPDATE: This technique no longer works on Linux Mint 17 Qiana. 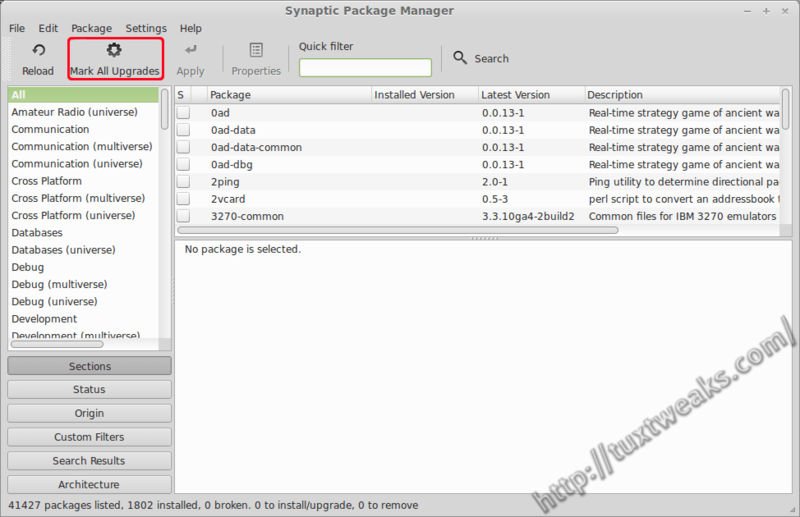 Please see Enable Synaptic Mark All Upgrades Button in Linux Mint 17 for the latest technique. I recently reviewed Linux Mint 15 Cinnamon Edition and one reader pointed out in the comments that the Mint team removes functionality from the Synaptic Package Manager. Specifically, the Mark All Upgrades button is missing from the tool bar and the menu selection is also missing from the Edit menu. After doing a little bit of research, I was able to figure out how to undo the changes made to Synaptic by the Linux Mint team. In the following tutorial I'll show how to restore the Synaptic Mark All Upgrades button in Linux Mint. Where did that button go? As I mentioned in the introduction, the Mark All Upgrades button is missing from Synaptic in Linux Mint. I think the philosophy of the developers is that you should use the Mint Update Manager with its priority system to apply system package updates. If you're coming to Linux Mint from Ubuntu or Debian, then you're probably used to being able to anything you want in Synaptic. Click on the screenshot below to see how Synaptic looks in a default installation of Linux Mint 15. As you can see, there is no Mark All Upgrades button on the toolbar. .overwrites files are read by alphabetical order and all overwritings are done in the end. If a destination appears more than once, only its last occurence is taken into account. .preserve files are read at the beginning. They can contain a list of destinations (one by line). Each destination appearing in a .preserve file doesn't get overwriten, whether or not it appears in .overwrites files. You can use sudo and your favorite text editor to create and save that file, or you can just paste the following long command into a terminal window. Now that you have your .preserve file you need to reinstall Synaptic. Use this command to take care of that. Now open up the Synaptic package manager and you should now see the Mark All Upgrades button on the toolbar. If for some reason you don't see the button, try rebooting your system. I don't know why you'd want to, but if you ever want to change Synaptic back to the way it was without the button, just remove the .preserve file that you made and reinstall Synaptic. Reboot your system and when you start Synaptic again you will see that the Mark All Upgrades button is gone again. So what's your preferred way to handle updates? Do you like Synaptic? Update Manager? Command line? Let me know in the comments. This content was originally published at http://tuxtweaks.com/2013/07/restore-synaptic-mark-all-upgrades-linux-mint. This is just the sort of "we know best" approach that has more or less driven me off Linux Mint back to Xubuntu and Debian. It would be slightly less annoying if all the Mint changes were well documented and designed to be parameterised so they can be switch off for people who know what they are doing. I've seen this "solution" many times. It may have worked in 2011 (when it was posted on mint forums), but it hasn't worked for me now in 2014. Thanks for the feedback. I haven't tried this in Mint 17 yet. I'll take a look. It looks like the Mint guys are providing their own package for Synaptic with a higher version than the one from Ubuntu. You need to apply the fix above and then downgrade Synaptic to the one from the Ubuntu repo. The button will come back, but as soon as you mark all upgrades and install, Synaptic will get upgraded to the one from Mint. I think his can be resolved by apt pinning the package for Synaptic. I'll write it up when I get something that works. Thanks for the heads up, but I must get on my soapbox here and complain about the geeky way you're instructing people to achieve it. It's no wonder people are put off trying Linux when confronted with long winded commands like this. Especially when most are not needed and can be accomplished via the GUI. A classic example is downloaded files that need the permissions changing to make them executable. Invariably you're told to enter a command in the terminal when it's much simpler to right click the file, pick properties and put a cross in the appropriate place in the permissions tab. For this fix I right clicked the desktop picked 'create document' copied and pasted the relevant lines, renamed it as the required name. Navigated to etc/linuxmint/adjustments and right clicked again and picked 'open as root' to delete the offending file and then add the new one. Then in synaptic I searched for itself, right clicked it and picked 'mark for reinstallation' Job done without using the terminal once. It might seem a long winded way of doing it in this example, but these are skills most people possess and give more understanding of what they're actually doing instead of (mostly blindly) copying a command into a terminal. I really do prefer apt-get, but I paid the cost to get up that learning curve a long time ago. Among GUI tools for Debian branch distros my top choice is Synaptic, both because it simply performs faster and because it gets in my way less.